Nearly two years of war have helped to trigger widespread hunger that is now affecting a third of the population. A new food security analysis details the severe hunger 3.9 million people in South Sudan are now enduring—80 percent more than a year ago. Called the Integrated Food Security Phase Classification, or IPC, the analysis cites conflict, record-high food prices, and localized crop failures as causes of the widespread problem, which is now affecting 34 percent of the population. The situation is particularly acute for 30,000 people in Unity State, says the analysis. “We hold grave concerns for the estimated 30,000 people experiencing extreme and dangerous hunger levels in war-ravaged Unity State, where, despite the peace deal, fighting continues to cut people off from aid,” said Zlatko Gegic, Oxfam’s South Sudan country director. That number is expected to climb 10,000 more by December, he added. Aid groups face deep challenges in the country: the UN appeal for 2015 is only 55 percent funded. But as important is bringing an end to the conflict, which erupted in the capital in December 2013 and quickly grew into a national, political, and ethnic crisis. Since then, more than 1.5 million people have been internally displaced while more than 500,000 have fled to Ethiopia, Kenya, Sudan, and Uganda. “This unbearable suffering will only end if the peace agreement holds, fighting stops immediately, and the long process of reconciliation begins,” said Gegic. Oxfam, which has been providing hundreds of thousands of people with a range of emergency help including clean water, sanitation facilities, food, fuel, and income support, is calling on the warring parties to respect the ceasefire so people can reach the help they desperately need. “The international community must continue to apply all diplomatic measures that will support the delivery of real, lasting peace,” Gegic said. 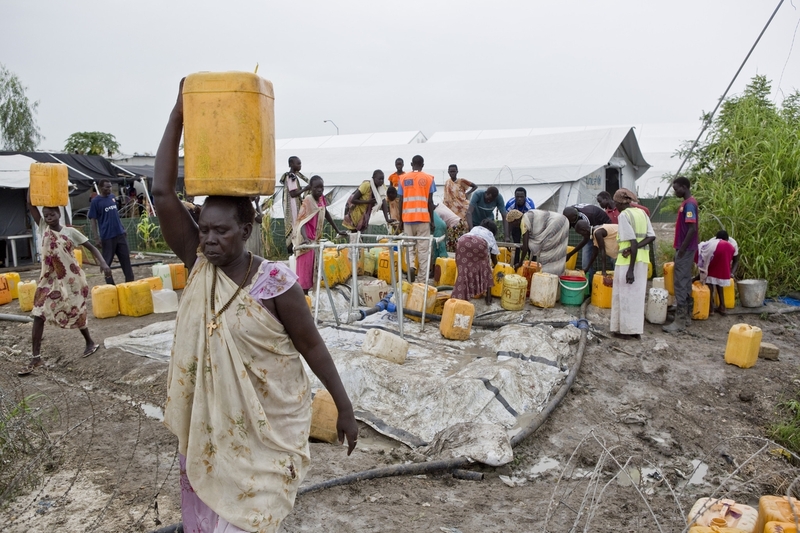 Help Oxfam rush food and clean water to families in South Sudan. Clean water and hygiene are weapons in battle against disease in Mozambique. The president’s threat to cut off aid to Central America continues to distract from the real crisis taking place. The Mozambique government is working quickly to set up cholera treatment centers in the devastated city of Beira, Mozambique as the threat of a cholera epidemic is high. Make sure your gift to Oxfam America goes directly to where it's most needed, without delay, with a secure online donation. © Oxfam America Inc. All rights reserved. Oxfam is a global organization working to end the injustice of poverty. We help people build better futures for themselves, hold the powerful accountable, and save lives in disasters. Our mission is to tackle the root causes of poverty and create lasting solutions. Oxfam America is a 501(c)(3) organization. Gifts are tax deductible to the full extent allowable under the law.